I placed my order last week. It's a Russian company, so its a bit of a crap shoot. When (or if) the minis get here, I'll post info about their quality and scale. Last Tuesday was the last game of the Dark Tower mini-campaign. Overall, my Cawdor fared well. They went 4-1-0 plus one 'bye week' due to an odd number of players. The campaign was restricted to 6 pre-selected scenarios and CO arranged pairings. The number of participants was small, but we had a good mix of gangs (Cawdor, Orlock, Genestealer Cult, Escher, & Venators). Since all of the games were played on Zone Mortalis boards, I made good use of grenades, bomb delivery rats, and the Cawdor heavy crossbow to blast models hiding around corners. 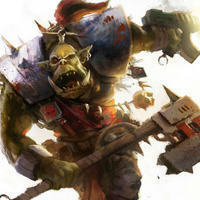 One Ganger (aptly named Demo) used his blasting charges to rack up 18 experience points in only 5 games (he "earned" 1 xp more for the bye week). Crazy. The only model that beat Demo in xps was my leader, Cutter John, and that's only because as a leader he was earning an extra 1 xp for every game that I won. Aside from the Ambush scenario, where I played the defender, my hardest fought game was Game 6. I fielded 11 models (1 leader, 3 champs, 1 sheen bird, & 6 gangers) in this final game. When the smoke cleared all of the Escher had fled (failed CL tests after a failed bottle test) or went OOA. All that was left of my gang was my leader, 3 champs, and 1 ganger (Demo) remained on the board. The other six models went OOA. Four went into Recovery and two of those suffered stat reductions. For me, the highlight of Game 6 was taking out the Escher leader with my Sheen Bird. The Escher had only one wound remaining when the birdie attacked, but she did have a 3+ save. Unfortunately for my opponent 2 of the Sheen Bird's attacks got through the leader's armor and since they are each damage 2 attacks, I got to roll 4 injury dice. Two came up skulls. To add insult to injury, the Escher leader's result on the lasting injury table was: Humiliated (-1 LD & CL). The Sheen Bird earned 2 xp for taking out the leader, 1 xp for rallying after failing a Nerve Test, and another 1 xp for participating in the scenario, for a total of 4 xp. Pretty damn good for a S3 T2 birdie. Sheen Bird stats are meh and its Bate rule make it a bit unpredictable, so I doubt that I'll ever repeat the success it had against the Escher. Nevertheless, taking down the Escher's leader has earned the birdie a model upgrade (I'm currently using a Puppets War resin raven). After a brief internetz searching I found the perfect models, PP's Cryx Carrion Thralls. Large crow or raven? Check. Exposed areas of bone? Check. Exposed mechanical components? Check. The similarities between the Carrion Thralls and the Sheen Bird's description and artwork makes me wonder if someone at GW lifted the concept from PP. 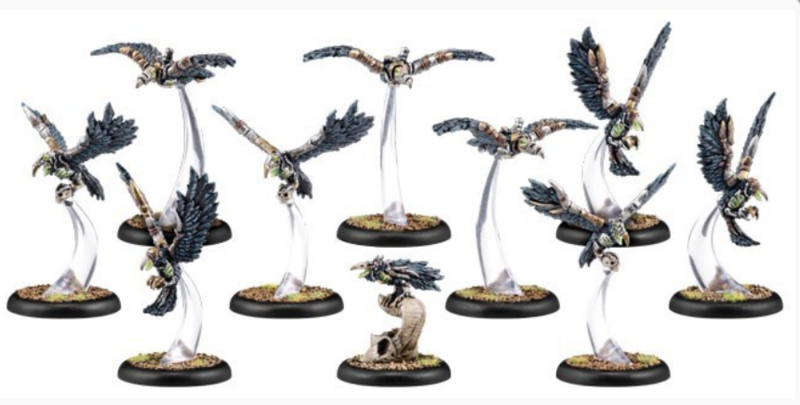 Sheen Birds are in the Ravenor Books. You're right. Ravenor was released 11(ish) years before PP's Carrion Thralls.